After dinner, we had dessert at fyi. Yes, it’s written in lowercase. It’s a yogurt stall near Omakase. For long-term visitors of this blog, you’ll know that beloved hates real yogurt. However, if you’ve read our experience at Qoola, you’ll know that beloved loved the yogurt she had there. Perhaps because of this last experience, she actually wanted to try it out. Or maybe because I won’t allow her to eat ice cream. 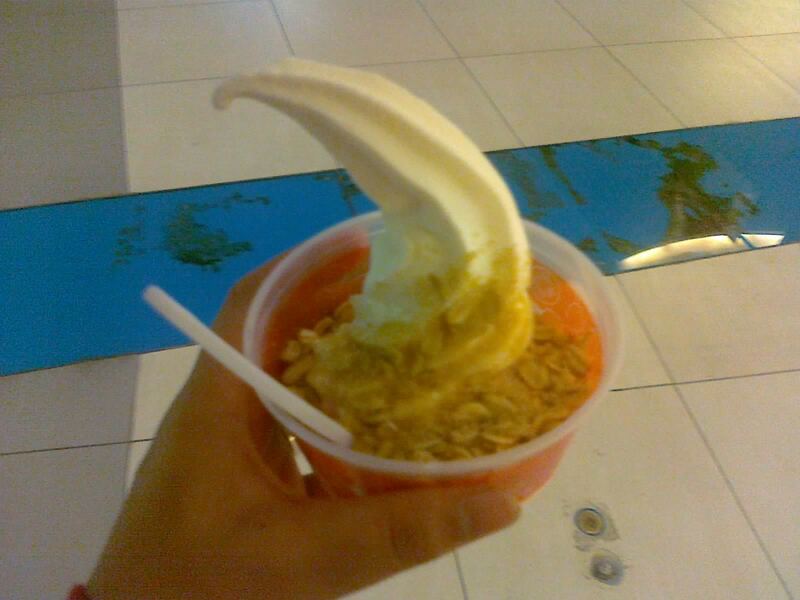 The place was pretty much similar to Red Mango, only orange. They have small and large cups and a decent selection of toppings. Beloved wanted to order a large cup for herself. After raising my eyebrows, she conceded to just the small cup (85 Php). She did, however, add granola toppings to her cup (15 Php) for a grand total of 100 Php. While the cup was small, the amount of yogurt certainly wasn’t. The granola was also a generous amount. But more importantly, how was it? Well, it was yogurt. Real yogurt is sour. This wasn’t flavored in any way like the one in Qoola. Heck, it wasn’t green tea yogurt. If you still don’t get it, it’s sour—very sour. Beloved had a scowl on her face. The granola made her happy, though. She did comment that this was a much more tolerable cup than the Red Mango, and she did manage to eat plenty of it (maybe because of the granola). Although I don’t really have yogurt cravings myself, I liked it. If you’re looking for a dessert after your dinner in Omakase or other restaurants in Il Terrazzo, fyi offers a generous amount of yogurt with a decent selection of toppings. I advise to stay clear if you don’t like yogurt or if you’re in a budget, though. But, hey, at least it’s healthier than ice cream. Recommended for: Yogurt lovers, health watchers looking for a cold dessert. Not recommended for: Yogurt or sour flavor haters. Smart nomnomnom tip: Their small cup is good for two not-so-hungry people.